Welcome to Cutting Edge Stencils! 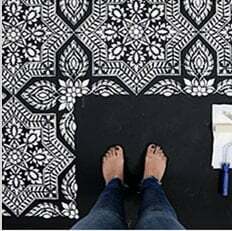 Easily paint your floor with stencils! Stencils are a perfect option for decorating a Baby's Nursery or Kid's room! Turn your child's room into a fun colorful space with these easy to use nursery stencil designs. Much more economical than wallpaper, and safer than adhesive vinyl wall decals, our modern nursery stencils are reusable, easy to apply and clean. Get creative with your own color combinations, or use our suggestions. Choose from flower stencils, allover pattern stencils or beautiful tree and branch designs. Visit our Stencil Ideas Gallery to see inspiring modern nursery decor ideas. Most of our customers have never stenciled before but found it incredibly easy and fun! Stencils are perfect for DIY nursery decor: they are economical, fun and allow you to customize your child's space. Please watch our How To Stencil Videos to learn a simple stenciling technique. Send us your pictures by completing and sending the form below. Maximum image width: 7000 px. Maximum image height: 7000 px. © 2018 Copyright Innovative Art Concepts, LLC. All designs, text and photographs are the property of Innovative Art Concepts, LLC and may not be copied or reproduced without written permission. Cutting Edge Stencils is a trademark of Innovative Art Concepts, LLC. Cutting Edge Stencils is based in the U.S.A. Site designed by Nisarga Design.